Welcome to the blog today! I'm entering a super simple two-fer today. 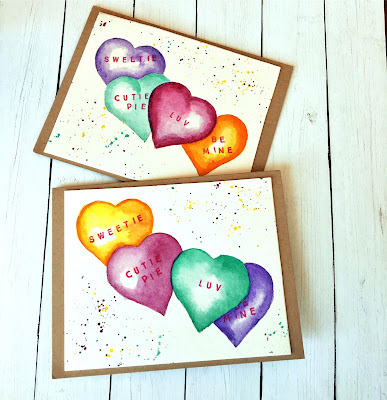 I made a couple of Valentine cards for my Olivia and Danny- two of my grandkids, and I'm entering these into the Simon Says Wednesday Challenge. To create these A2 sized cards, I began by die-cutting a generic heart die and used the negative as a stencil. I arranged them across a watercolor paper panel and erased the overlapping lines. I pulled out some watercolors and chose four different colors to paint them. Once dry, I stamped the Mama Elephant 'Lots Of Letters' alphabet stamps in Distress Oxide Picked Raspberries. I googled the words to use for the candy hearts and it was very easy peasy - a fun one to make. To finish it off I splattered all the different colors I used and mounted it to some Neenah Desert Kraft cardstock. Thanks for reading this!